Car shoppers are having an easier time obtaining credit, signaling U.S. auto sales may continue to accelerate after last month reaching the fastest pace since the government's “cash for clunkers” program. DETROIT (Bloomberg) -- New-vehicle buyers are having an easier time getting credit, signaling U.S. auto sales may continue to accelerate after last month reaching the fastest pace since the government's “cash for clunkers” program. Federal Reserve data shows banks began easing consumer- lending standards in July, and the Fed's loan facility program rejuvenated the market for securitized auto debt, said Ellen Hughes-Cromwick, Ford's chief economist. Data from CNW Research shows improved sales for buyers with weaker credit scores. Auto retailers including Group 1 Automotive Inc. and CarMax Inc. have said credit is less of a setback now after tighter lending helped slow U.S. auto sales to 10.4 million deliveries last year, the lowest since 1982. Sales in September rose to a seasonally adjusted annual rate of 12.2 million, the fastest pace since August 2009, as calculated by the Automotive News Data Center. That's still less than the 16.8 million annual average from 2000 to 2007, as Americans defer big-ticket purchases amid weak consumer confidence and high joblessness. Payrolls fell by 95,000 workers last month, more than forecast in a Bloomberg survey of economists, as the unemployment rate held at 9.6 percent, according to Labor Department figures released today. The share of new-vehicle sales to buyers with subprime credit rose to 9.9 percent in September, the highest since February 2008, according to consulting firm CNW Research. Subprime buyers represented 6.8 percent of the new-vehicle market through the first nine months of the year, according to CNW. That's up from 5.7 percent last year, while short of the 14 percent share in 2006, the data shows. CNW, based in Bandon, Ore., defines subprime borrowers as having a FICO score below 619. Fair Isaac Corp.'s FICO scores use variables including the number of credit inquiries and missed payments. 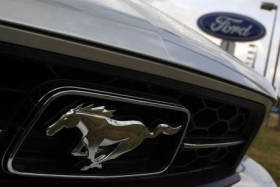 Ford Motor Credit Co., the automaker's finance arm, sold $500 million of bonds backed by dealer payments last month and had a similar offering worth $1.13 billion in March with help from the Fed's Term Asset-Backed Securities Loan Facility. The program, started in March 2009 to help revive the market for securities backed by consumer-loan payments, encouraged more offerings and narrowed spreads, Hughes-Cromwick said. That allowed for companies to more cheaply fund automotive purchases, including leases, as well as loans that car dealers use to buy inventory. The Fed's quarterly survey of senior loan officers released Aug. 16 showed banks were more willing to make consumer loans during the previous three months. The survey includes 57 U.S. banks with about $7 trillion in assets and doesn't identify respondents. General Motors Co., the largest U.S. automaker, sees “some significant upside” to sales as credit “loosens up,” Don Johnson, GM's vice president of U.S. sales, told analysts and reporters during an Oct. 1 conference call. September deliveries at GM, which completed its acquisition of subprime lender AmeriCredit Corp. last week, climbed 11 percent from a year earlier to 173,155, the company said. “The credit freeze has hampered sales in the industry,” Johnson said. “That's one of the reasons why it was so important for us to put this relationship together with AmeriCredit.” It began operating as General Motors Financial Co. effective Oct. 1 and today Standard & Poor's Ratings Services put it on credit watch with positive implications. New-vehicle buyers received an average annual percentage rate of 5.23 percent from Ford in September, from 5.07 percent in August, according to Edmunds.com. The rate among GM buyers rose to 5.25 percent from 5.23 percent, Edmunds said. “The slight increase in rates suggests that credit is loosening a touch, since less-qualified buyers are getting loans and bringing up the average,” Ivan Drury, a Edmunds analyst, said in an e-mail. CarMax, the auto retailer based in Richmond, Va., said on a Sept. 22 conference call that lenders showed an increased willingness to expand credit. “We are about back to where we were pre-recession in terms of credit availability,” CarMax CEO Tom Folliard said on the call to discuss second-quarter earnings, which beat analysts' average estimate in a Bloomberg survey.